Boat race, originally uploaded by VeroC. We have ship-building competitions from time to time. 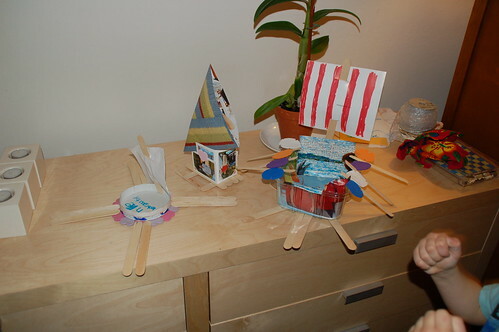 The rules are simple: materials should only consist of "stuff from the recycling bin," popsicle sticks, and glue. Participants are permitted to add artistic flourishes with paint, stickers and markers. Entries are rated on creativity, ingenuity, and (of course!) sea-worthiness. I like the little excited hands in the corner of the photo!!! Another fab idea – you are such a busy creative family. really inspiring. I’m glad I’ve found you! I had toddler-hood down pat. But now that my kids are older, I’m having a difficult time “capturing the joy of childhood.” I’m coming here for inspiration — and maybe today, the boats are in order. Thank you again for such a wonderful site.